Where Do Our Seniors Live? 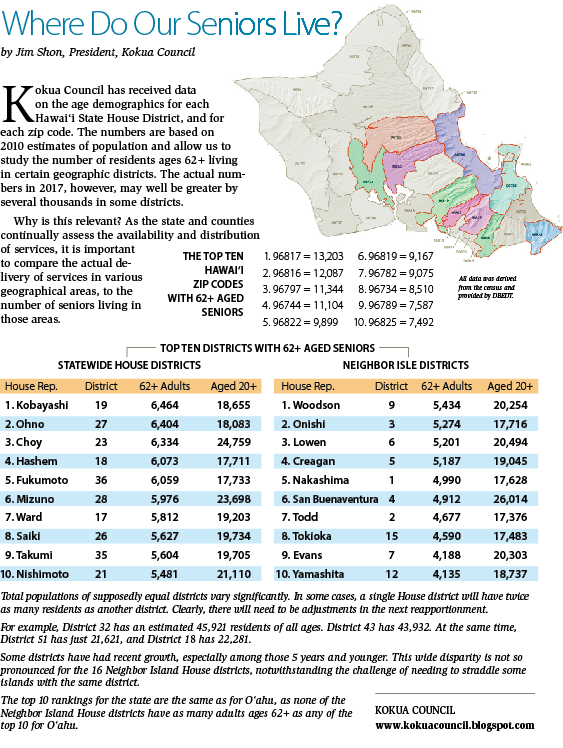 Kokua Council has received data on the age demographics for each Hawai‘i State House District, and for each zip code. The numbers are based on 2010 estimates of population and allow us to study the number of residents ages 62+ living in certain geographic districts. The actual numbers in 2017, however, may well be greater by several thousands in some districts. Why is this relevant? As the state and counties continually assess the availability and distribution of services, it is important to compare the actual delivery of services in various geographical areas, to the number of seniors living in those areas.